Before we switched to a plant based diet, we didn’t pay much attention at all to what we were putting into our bodies. We didn’t think about the nutrients we were getting from our diet each day. We didn’t have a clue how much of anything we were supposed to be getting. Most days we just ate whatever sounded good to us. Our food was solely based off of our mood. It took us a very long time to switch from the “living to eat” mentality, to “eating to live”. Cheese was a staple in our diet. We put it in everything. When I started learning about veganism, I knew it was the right thing to do for ourselves, the animals, and the planet, but I personally could not wrap my head around the idea of giving up cheese. It took me two whole years to overcome this mentality. I gave up meat easily, and was a vegetarian long before I went fully vegan. But even as a vegetarian, I wasn’t knowledgeable in nutrition and what my body actually needed to thrive. If this sounds like you, you are not alone. This is a common occurrence with new vegans and vegetarians. We aren’t taught in school how to be healthy, and many parents aren’t aware either. If they don’t know, they can’t teach it to us! Lucky for you, we have easy access to an abundance of research and information to help us become more educated and informed on health than ever before. If you search for “healthy recipes” on Pinterest or Google, you will get a very mixed idea of what is healthy. Some say lean meats are healthiest, some say low carb or keto. Others say Paleo, or gluten free. There’s calorie counting, and carb limits, high protein or low sugar diets. 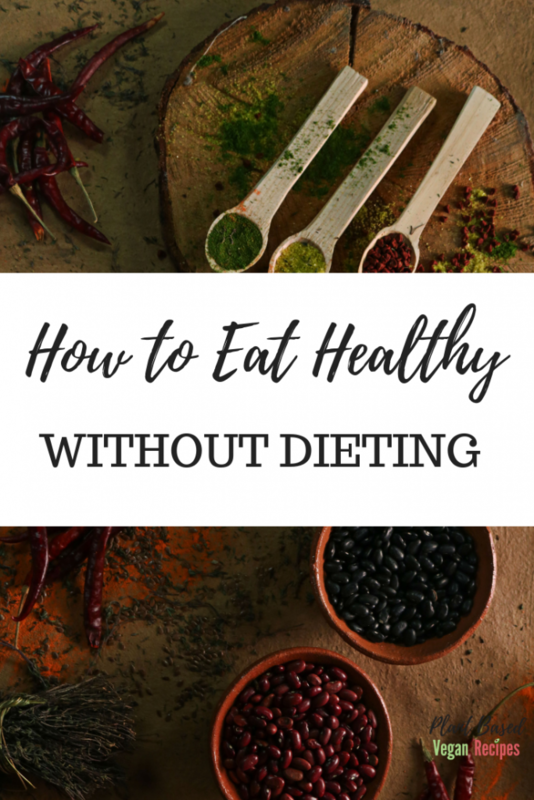 How in the world do you know what to eat when there is so much conflicting advice out there? What makes any of these diet plans better or worse than the next? What is healthy for our bodies? Seriously. There seems to be a large misconception that health=weight. When you hear people say “I want to get healthy” they are usually talking about obtaining a healthy weight. Health is not based solely off of your weight or BMI. You can be skinny and still be unhealthy. You can be 110 pounds and still get heart disease, diabetes, high cholesterol, and cancer. Low BMI does not equal health. Health is about taking care of your body. Health is getting the proper nutrients needed to thrive. It’s making sure your body is well taken care of, physically and mentally, inside and out. The ONLY way to achieve optimal health is by eating a clean, whole food, plant based diet. Don’t believe me? Here is a quick list of just a few research studies proving this. 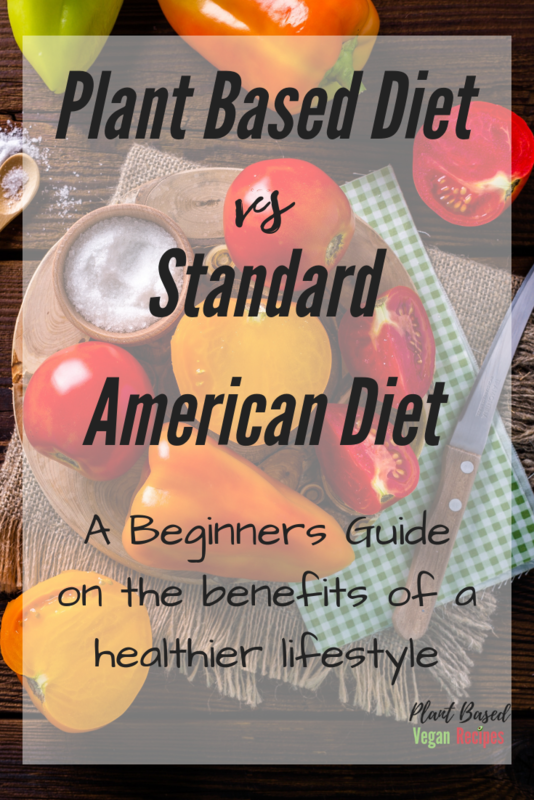 The majority of us grew up on a Standard American Diet, consisting heavily of meat, dairy and eggs. Eggs and bacon for breakfast, ham and cheese sandwich with a bag of chips for lunch, and meatloaf and potatoes for dinner. That’s if you’re cooking at home! Many of us these days rely on fast food and take out to feed us around our insanely packed schedules, which is even worse for our health. We were brought up to believe that protein and calcium are extremely important, and as long as you had your vitamin D milk with your meals you are all set. This simply is not true. Most Americans are severely lacking in essential nutrients such as fiber, magnesium, and vitamins A, C, and E.
When you begin your transition to a plant based vegan diet, the first thing everybody is going to want to ask you is, “But, where do you get your protein?” There is a common misconception that protein only comes from meat. There are actually many plants that contain just as much, if not more protein than meat! As you can see, there many plant based options for protein. Most adults require somewhere around 30-50 grams of protein per day. You can easily achieve that with a bowl of split pea soup! See, being vegan isn’t that hard! The other problem with the protein myth, is many Americans consume well over the recommended serving portions of meat and dairy per day. Most adults on a standard American diet eat too much protein, which is actually a bad thing. Check out this video from Dr Michael Greger on how we were led to believe we needed so much protein. Another myth we all grew up believing was that we need cow’s milk for calcium. It’s just not true! There are so many ways to get your calcium, there is no need to cause any suffering to obtain it. If milk is your thing, and you can’t live without it, there are plenty of non dairy milk options. Here is our list of plant based milks, comparable to the 30% of calcium provided by a cup of dairy milk. However, we do not necessarily need milk, of any kind. There are plenty more ways to get your daily calcium requirements without any milk at all. Most of us should be getting around 1,000 mg of calcium a day. Foods such as broccoli, sweet potatos, kale, and soybeans provide plenty of calcium. There are so many choices, it does not need to be milk. Not to mention there are even studies showing milk actually does not reduce your odds of bone fractures. When you first switch to a more plant based diet, you will probably want to recreate some of your favorite foods. That’s perfectly fine. There are plenty of meat and cheese substitutes out there to satisfy your cravings. Many restaurants offer vegan options, and some pizza restaurants even offer vegan pizza now. Don’t deprive yourself from a treat now and then. Many of these products are processed foods which are not that good for your body, so just make sure a majority of your diet consists of healthy plant foods. Many of us are familiar with the food pyramid, which is now called the MyPlate. 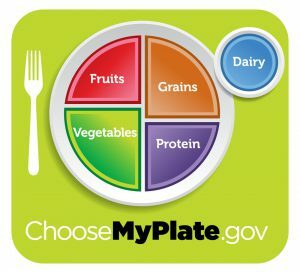 With the MyPlate, it is suggested to have half of your plate consist of fruits and vegetables, and the other half grains and protein, along with a serving of dairy. The problem with this, there is no way to tell if you are getting all of your nutrients this way. Your dinner plate could consist of fried chicken, macaroni and cheese, cole slaw, and apple pie with a glass of milk. Sure, you hit all the sections on the plate, but that doesn’t make it healthy for you. Realistically, many of us are not even following the MyPlate guidelines. It seems some of us are doing what we used to do, and eating based on their mood. Whatever sounds good is what they choose to eat. Even worse, a majority of Americans are eating fast food daily. This is not a healthy way to live. If you hit up McDonalds on your lunch break and pick up a big mac and fries with a coke, this meal alone exceeds your daily limits of fat, sodium, and sugar. This will take a toll on your body over time. You may not see it now, but eventually it will catch up to you and you will be forced to make a lifestyle change in order to live. Why not make the change now and avoid all of that? After reading “How Not to Die” by Dr Greger, we started utilizing the “Daily Dozen” Checklist. This is a slightly more detailed concept than the MyPlate, because there are 12 different goals vs the five standard food groups. This checklist also specifies how many servings of each that you should aim for each day. Dr Gregers book is a fantastic read for anyone just starting out on a plant based diet, we highly recommend this book to everybody and have read it several times! This is a very normal day for us in our home, we eat these exact meals often! They are quick, easy, delicious, and very healthy for your body. 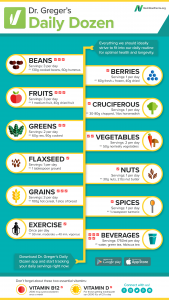 Compare this to what you typically eat now, are you getting everything you need? Where are you lacking? By eating a variety of foods on a plant based diet, it is extremely easy to satisfy all of your daily nutritional requirements. In my opinion, it is easier as a vegan than as a meat eater! We can no longer continue to eat blindly if we want to have a happy, healthy life. It is important to know not only what you are putting into your body and where it comes from, but to also know what your body needs. Start taking small steps now to a healthier lifestyle. You will find you eat a wider variety of food, stay fuller longer, and you’ll feel better than ever before.